The current Chesterfield FC dates from April 1919, and was formed as the Chesterfield Municipal FC. At least four other clubs have carried the town's name and it is possible to trace a line of "ancestry" from one to the other through various common players and administrators. What can we say with absolute certainty about the origins of football in Chesterfield? Only that the organised game in that town goes back a very long way. The most widely-held view is that the club was founded in 1866. A long and continuing search for contemporary documentary evidence to support this claim has so far failed to turn up anything, but I keep looking. 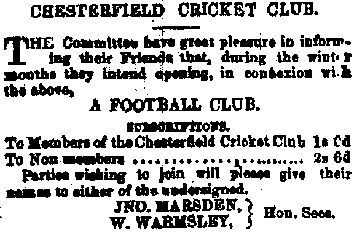 There we are, then - a "Chesterfield Football club" existed in January 1864. "Yesterday, teams from the Chesterfield and Garrick (Sheffield) football clubs contested for superiority in the Recreation Ground, Chesterfield, and after some spirited play the Garrick gentlemen were returned the victors. Considering that the Chesterfield club has only been in existence a few months, they played with remarkable skill and pluck." So, where does "1866" come from? The first reference I have seen to an 1866 formation appeared in the 1905 Book of Football, in an article which was written by George Oram, a club director, and which contained various factual errors. My suspicion is that Oram over-egged the pudding in order to make Chesterfield "older" than its near neighbours, Sheffield Wednesday, in an attempt to establish some sort of bragging rights in that respect. Long before desktop publishing came along with its “copy and paste” commands, Oram’s work was copied down the years to form the basis of every subsequent article about the club, right up to programme articles in the 1990s. We look more closely into the "Book of Football" article here - please have a read. Could Oram have got it wrong? He was writing forty years after the event, and we can't say if any contemporary evidence - minute books, and the like - survived to help him. Information in his article about events only ten years previous were wrong, so why should he have been any more accurate with events forty years before he wrote? Twenty years after the landmark Anglo-Scottish Cup win over Rangers, I was stopped outside the Rec' by a fan who insisted that I'd got that game's goalscorers wrong in "The Definitive Chesterfield FC." I hadn't, but it shows that memories and "hand me down" stories are an unreliable basis for the assertion of fact. Irrespective of when it was formed, this first club folded in 1881, largely through lack of interest in anyone taking charge of its small debt. A knot of its players sought to re-establish the side as “Chesterfield United,” and this side may have played on into the 1890s, although mention of it after its inaugural season (1881-2) is very hard to find. The attraction of the more successful Spital club, who operated on a field near Horns Bridge, drew Chesterfield players away, and those who did not pledge allegiance to either side dissolved into a growing pool of local clubs. The second Chesterfield FC appeared in 1884, meaning that three years passed without any "Chesterfield FC" in operation. There is a story that another local club, the Spital club, simply changed its name to Chesterfield FC and moved up to occupy the Rec but, since the Spital club continued playing after 1884 this must be discounted, although it is fair to say that players from Spital formed part of the first playing staff of the new club, with the others players being identified as from the first Chesterfield FC, and a local side named Chesterfield Livingstone. This club became known as the Chesterfield Town FC sometime around the late 1880s, but a proper, legal name-change waited until the club became a limited company in 1899. This is the Chesterfield Town club that competed in the Football League between 1899 and 1909. The Chesterfield Town FC (1899) Ltd was put into voluntary liquidation in 1915, and another Chesterfield Town FC was formed immediately, to play under the peculiar conditions of domestic wartime football. Nowadays the same sort of thing happens when a club goes into administration, so it perhaps appropriate to consider both these "Chesterfield Town" sides as one. The second one was run as a one-man band by its founder and sole owner, a Mr CW Everest. This club became extinct after an FA enquiry banned all its players, management and its Chairman in 1917, in the wake of an illegal payments scandal. This left a vaccum that the Chesterfield Borough Council filled by the formation of the Chesterfield Municipal FC on April 24th, 1919. It soon became clear that the game's authorities would not contemplate a municipal framework for football, though, and the club was forced to become independent of the council, which it did in December 1920, and changed its name to Chesterfield FC. That Chesterfield FC is the one that we watch today. Strictly speaking, the 1919 club went into administration in 2001 and was replaced by another company. In keeping with recent form, though (Middlesbrough, Bristol City and many more), this was not regarded as a change of club, as such. Why not consider all the clubs as one, then? In a sense you could, and it is fun to look upon the whole thing a a big "family tree" of local football, but you'd have to ignore whole seasons that passed without a Chesterfield FC, and clear breaks in playing and administrative continuance to do so. What should you believe, then, when it comes to the club's formation? Well, that's up to you, really; having studied it, I can't put a lot of faith in Oram's version. And consider this: while it's nice to be descended from the fourth oldest club in the league (or third-oldest, if you listen to those who query Stoke's history, and second-oldest, if you want the 1864 thing!) I think it would be an absolutely cracking boast to say we were the first (and so far only) municipal club in senior British football. In our rush to be older than them up the road, we might be overlooking something far more significant.